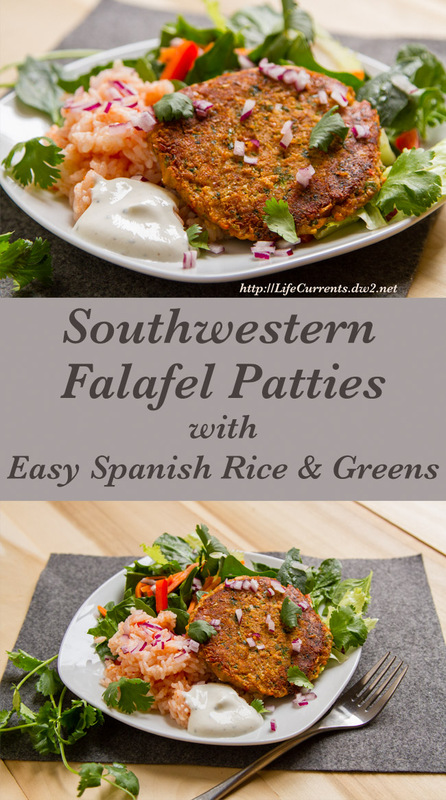 Cookbook update – “Cupboard Cooking” with Southwestern Falafel a great dinner with southwestern flair! I’ve been testing recipes for the cookbook for a while now, and feel pretty happy with the content. I have about 70 recipes ranging from breakfast to soup to main dish and onto desserts. I think it’s a pretty good range of things with different tastes and textures and colors. I still have a few more I’d like to test, but if they don’t make it to the book, so be it! Now, I’m starting on the layout and design of the book in the computer. I’ll admit this part is a little intimidating to me. Yes, I’m fairly decent on computers, but this book is uncharted territory for me. And, I have to decide how I want to the book to look. So, I’ve been perusing some of my other cookbooks to get an idea of what I like as far as layout. I know I can do this – no problem – but just making those first few decisions and sticking with them may be a bit tough (remember, part of the reason I’m a vegetarian is to simplify my life and my decision -making challenges- I’m not a big fan of too many choices!). So, wish me luck on this part! And, for now, here’s a recipe that I worked on this week. I was extremely happy with the flavor – really yummy! The falafel requires a little bit of chopping, but once that’s done, mixing it together and cooking it up is a snap. Oh, and don’t worry about it looking a little dry once you put in the egg white – it holds together pretty well (and, the nice thing is that if you do end up with scrambled falafel, it gets hidden in the pita anyway, and it tastes just as good). If you want to try making your own homemade flatbreads to go along with your Falafel, hop over to this recipe. While I was taking the shots of the falafel, a bee landed on my flower arrangement. If you look closely at his legs, he’s covered with pollen. Place beans in a medium bowl and mash with a fork or a potato masher until a coarse puree forms. Add cheese, tortilla chips, scallions, bell pepper, cilantro, garlic, chili powder, salt, and egg white; stir until well combined. Scoop into ¼ cup measuring cup, and shape into 8 (3-inch) patties. Spray a nonstick griddle or skillet with cooking spray and heat over medium heat. Cook falafel 2 to 3 minutes per side, until browned and heated through. Toast pita in the toaster oven or on a dry skillet until warmed. Place a falafel in each pita and top as desired. Enjoy! Serve falafel in pita with toppings of thinly sliced red onion, sliced tomato, shredded romaine lettuce, cabbage, hummus, avocado, sour cream, or whatever your heart desires. I like to serve these family style so that everyone can top with whatever they like.